The death of Sarah, Abraham applies for a burying-place. (1-13) Sarah's burying-place. (14-20)1-13 The longest life must shortly come to a close. Blessed be God that there is a world where sin, death, vanity, and vexation cannot enter. Blessed be his name, that even death cannot part believers from union with Christ. Those whom we most love, yea, even our own bodies, which we so care for, must soon become loathsome lumps of clays, and be buried out of sight. How loose then should we be to all earthly attachments and adornments! Let us seek rather that our souls be adorned with heavenly graces. Abraham rendered honour and respect to the princes of Heth, although of the ungodly Canaanites. The religion of the Bible enjoins to pay due respect to all in authority, without flattering their persons, or countenancing their crimes if they are unworthy characters. And the noble generosity of these Canaanites shames and condemns the closeness, selfishness, and ill-humour of many that call themselves Israelites. It was not in pride that Abraham refused the gift, because he scorned to be beholden to Ephron; but in justice and in prudence. Abraham was able to pay for the field, and therefore would not take advantage of Ephron's generosity. Honesty, as well as honour, forbids us to take advantage of our neighbour's liberality, and to impose, upon those who give freely. 14-20 Prudence, as well as justice, directs us to be fair and open in our dealings; cheating bargains will not bear the light. Abraham, without fraud or delay, pays the money. He pays it at once in full, without keeping any part back; and by weight, current money with the merchant, without deceit. See how anciently money was used for the help of trade, and how honestly it should be paid when it is due. Though all the land of Canaan was Abraham by promise, yet the time of his possessing it not being come, what he had occasion for he bought and paid for. Dominion is not founded in grace. The saints' title to an eternal inheritance does not entitle them to the possessions of this world, nor justify them in doing wrong. Ephron honestly and fairly makes a good title to the land. As that which is bought, must be honestly paid for, so that which is sold, must be honestly delivered and secured. Let us manage our concerns with punctuality and exactness, in order to avoid contention. 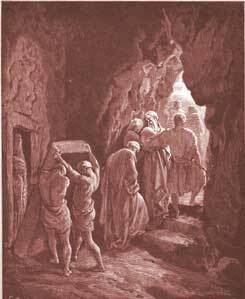 Abraham buried Sarah in cave. or vault, which was in the purchased field. It would tend to endear the land to his posterity. And it is worth noting, that a burying-place was the only piece of the land which Abraham possessed in Canaan. Those who have least of this earth, find a grave in it. This sepulchre was at the end of the field; whatever our possessions are, there is a burial-place at the end of them. It was a token of his belief and expectation of the resurrection. Abraham is contented to be still a pilgrim while he lives, but secures a place where, when he dies, his flesh may rest in hope. After all, the chief concern is, with whom we shall rise. Verse 11- Abraham earned the respect of his neighbors because he was a faithful and God-fearing man. Ps. 90:10 - this Psalm was written by Moses; he had nothing to do with Gentiles as a whole (only a very few that recognized the God of Israel and were accepted); the ages are spoken of for God's people - of which the few Gentiles were counted as. The same for ch. 91. Compared how long people lived in their days note that sarah did early at 127yrs. Why? God is honored when we behave in a christlike manner after the death of a dear one! The lesson i learnt from the life of Abraham in this Chapter is not to take anything for granted when you are making any purchase like land, property, car etc. Make sure you get a clean verifiable, authenticated receipt so there is no dispute in the future. The tendency is to forget collecting a receipt from the seller who is very familiar or close to you. Our Spirituality does not mean we should forsake good common sense in our daily transactions. Abraham was very rich but was not a money waster who spent foolishly. He must have been a good saver and prudent in his spending. This is food for thought. It is giving us a type of Christ in Abraham. Christ will come to a place where he will now change the image of his bride the church and bury the old, just as Abraham buried Sarah his wife. Christ's action will not be opposed even by people who are earthly as opposed to heavenly people. They will even recognize him as the Prince and Lord on that day. His power will prove unmatched by the Devil's power.The people at Mamre succumbed to Abraham's request as a stranger. Abraham who walked away from his kingdom trusting the word of GOD, has become a "mighty prince" as said by the inhabitants of kirjath-arba. Follow the word of GOD and be followed by blessing. Abraham was indeed a humble man and a man of faith. What Do You Think of Genesis 23? How old was Sara when she died?